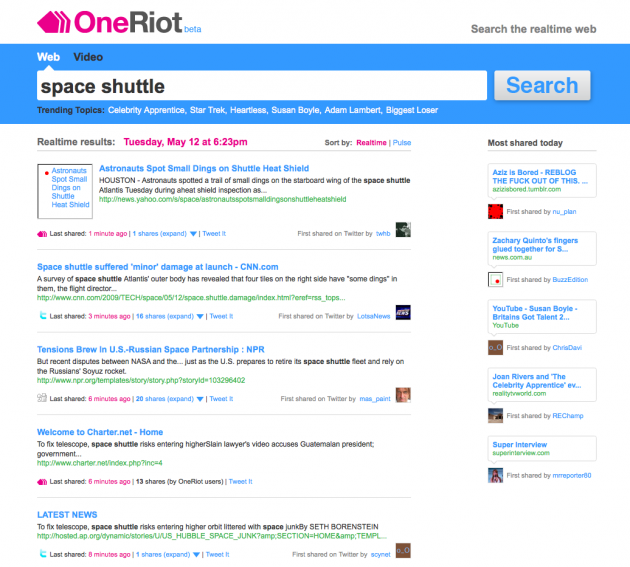 Today saw the launch of two new real-time search engines, from OneRiot and Tweetmeme. While the two are slightly different in ways that I went into earlier, all that really matters are the results you get. So I put those two to the test along with Twitter Search, Google Search, FriendFeed and the recently launched Scoopler. To see which would give the best results based on a current event. 1. Google: The top result was from a Google News story about the shuttle damage. That’s good, that’s what I was looking for. The rest was historical information I didn’t want or need. 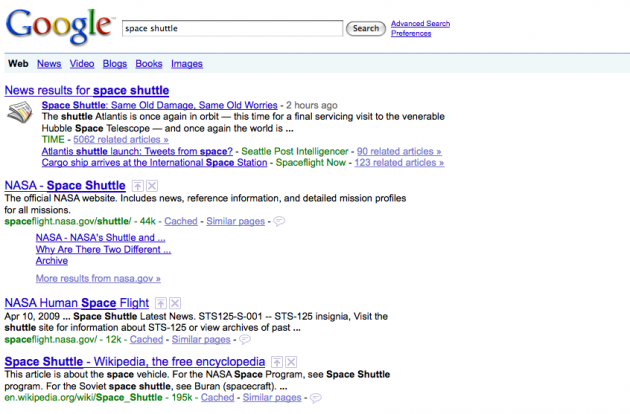 Sure, I could have used a Google News search, which would have no doubt returned more relevant results (but maybe not that relevant), but most people still use just regular old Google.com, so that’s what I did. 2. 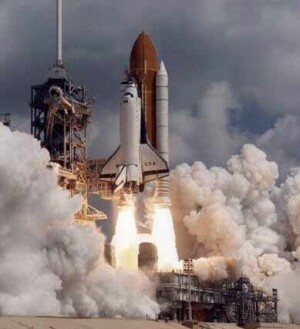 Twitter Search: The first result is pretty telling: “Just watched the space shuttle go overhead — so cool” That’s nice, but gives me absolutely nothing in terms of what I’m looking for. The second and fourth results were good and gave me links for more info — now you see why Twitter wants to (and should) get into the business of crawling links for its search results. 3. 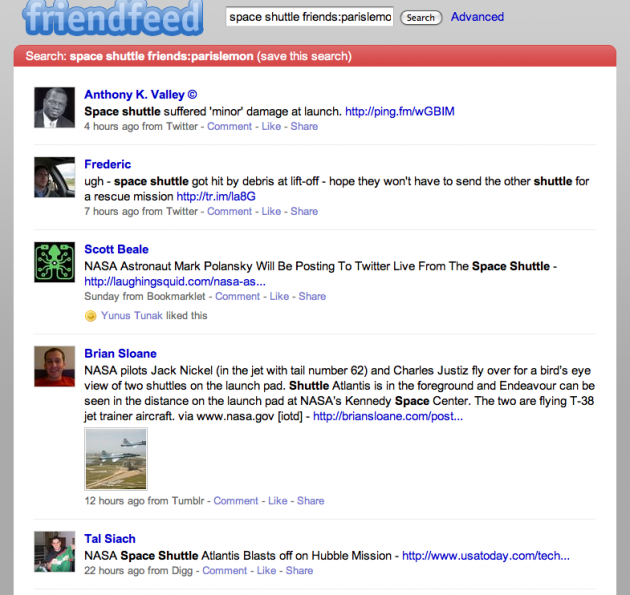 FriendFeed: The top two results are good, but the rest are just general information about the launch. This is an interesting set of results because unlike Twitter Search results, FriendFeed filters everything through my friends by default. That’s good for certain searches, but maybe not so good for big, meaningful searches when you’re frantically looking for information. 4. 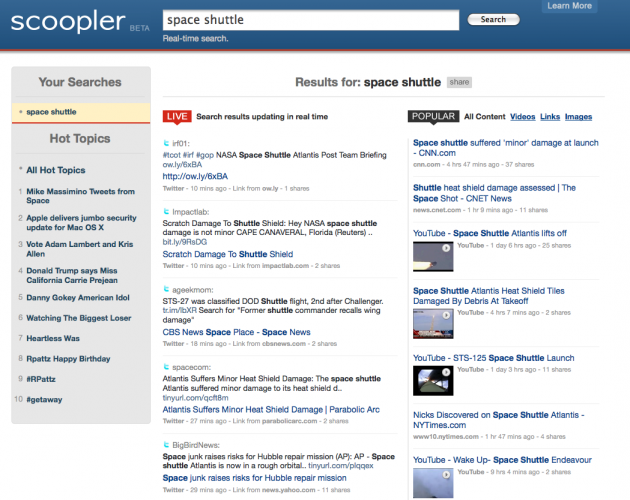 Scoopler: With its mixture of live tweets coming in and popular content, Scoopler gives me some pretty solid results for what I’m looking for. And it’s presented in a way that’s pretty easy to follow. I like this one, a lot. 6. 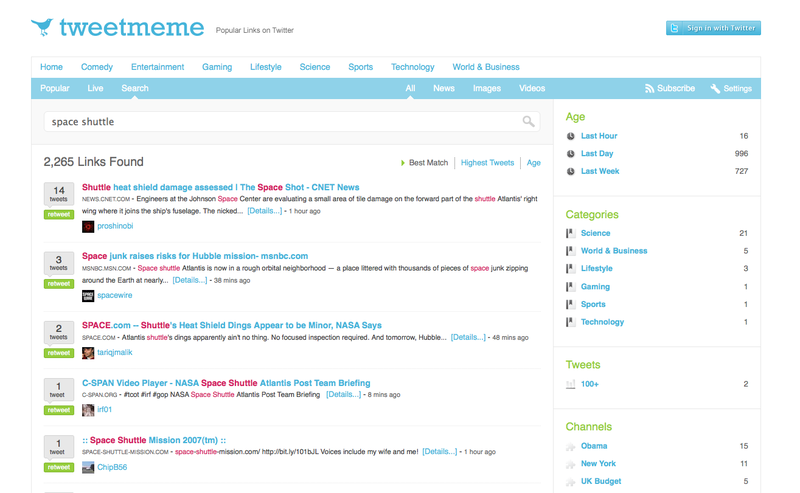 Tweetmeme: Tweetmeme’s search defaults to the “Best Match” area which gives you a solid result for the number one and three items. When sorted by “Age,” the results are all over the place. Second test: For a second test (not pictured), I did a query for “Miss California” — another hot topic on the web right now. Being as this one is a little less time-sensitive, the results were better across the board. 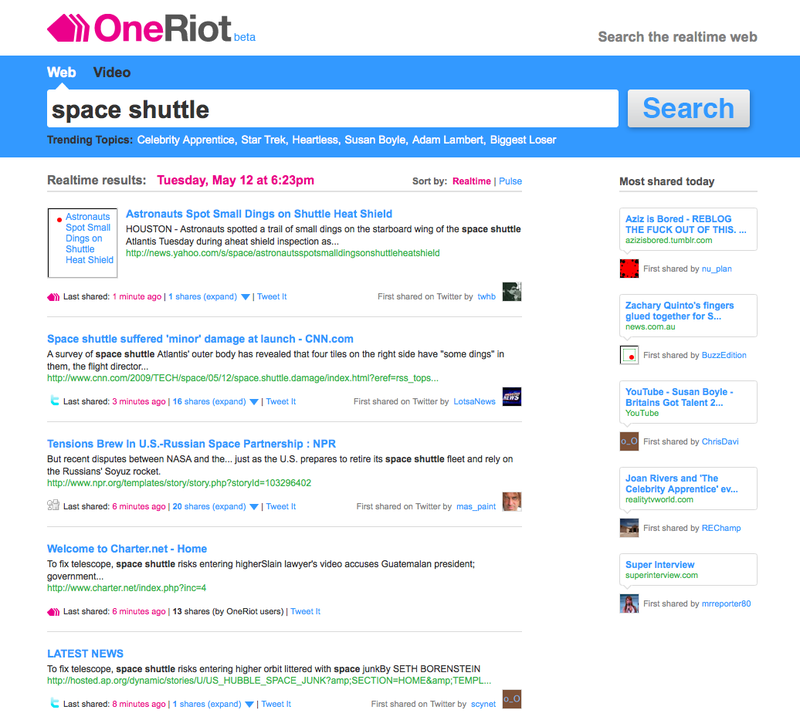 OneRiot showed quite a few Digg results this time around, and even Google had some relevevant links beyond its Google News top area hits. Scoopler had some good popular results, but its Live area was dominated by tweets mostly making jokes to friends about the beauty queen. 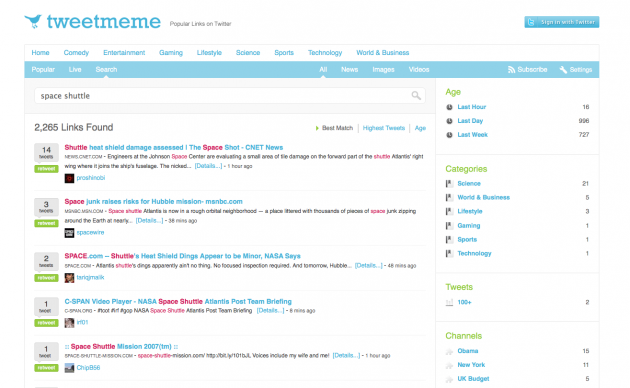 Tweetmeme’s “Highest Tweets” area really shined here. Conclusion: It’s hard to declare one single winner because results vary based on how fresh the topic being queried is. Scoopler seems to work very nicely for breaking news as it mixes in an auto-refreshing Twitter search stream (as I keep going back to, it’s dominated by tweets) with popular items. Tweetmeme seems to work very well for slightly older items that have been retweeted a lot. OneRiot is nice in that it crawls the individual pages to get better content, but for breaking news, I’m not sure that it actually works better than a quick topical scan of a bunch of items. 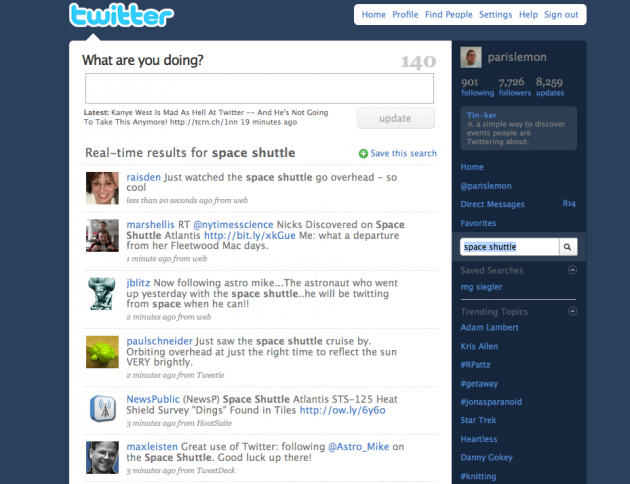 And FriendFeed’s search is great if you want to see what your friends are saying about something, but trickier if you go outside your social circle. It seems pretty clear why Google is interested in adding a real-time layer to its search capabilites, while Twitter wants to crawl pages with its engine — the combo is pretty killer.